This shows only the first of 11 slides, please download the PDF to see the full example. 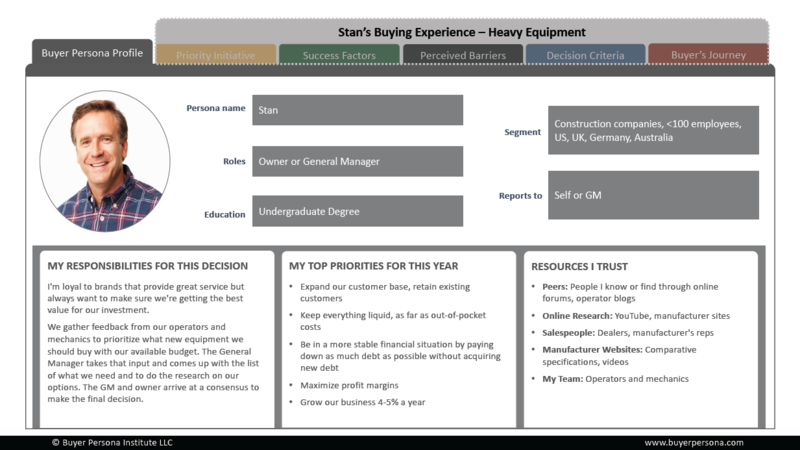 This example buyer persona is a composite of several persona studies for only loosely related buyer’s journeys. We would have loved to show you an example of an actual study. But our clients know that insight into their buyer’s decisions is a competitive advantage, guiding sales and marketing engagement based on what buyers want to know and experience throughout their buying journey. It’s hard to argue with that. So have a look at this example, but if Stan happens to be your target buyer, remember that we’ve deliberately removed the most valuable insights.